So what do you do when you have several thousand photos of cargo bikes in your archives? Well, it's 2013... you slap them into a Blurb book, of course. There are two reasons for producing this book. Firstly, the rise of the cargo bike as a transport solution in cities continues unabated. Secondly, out of the 15,000 or so photos I have taken while documenting bicycle culture in Copenhagen and other cities around the world, easily 3000 are of cargo bikes. While I'd like nothing more than putting them into old school photo albums and inviting you all over for coffee while we leaf through the photos together, this book is probably a more logical solution. 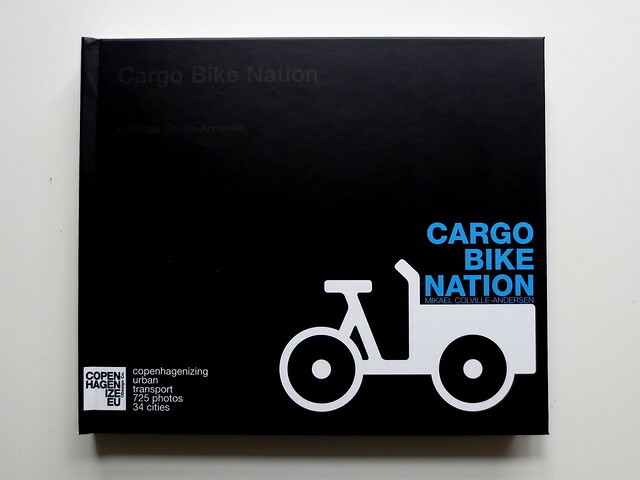 What you'll find in these pages is photo after photo of cargo bikes, as well as bicycles with cargo. There are 725 photos on offer. 615 of them are from Copenhagen. Not surprising considering that is where I live and that Copenhagen is easily the cargo bike capital of the world, with 40,000 cargo bikes in action. 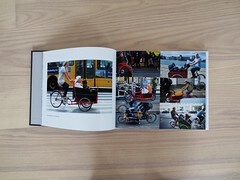 There are, however, photos from 33 other cities on every continent that I've taken on my travels as CEO for Copenhagenize Design Co.. A large number are from Rio de Janeiro and Sao Paulo, where the cargo bike still serves the citizens for deliveries of goods. In the Copacabana neighbourhood of Rio de Janeiro alone there are 11,000 cargo bike deliveries a day. Where in Copenhagen the cargo bike is primarily used by families, in Rio it is pure logistics. The number of cargo bikes in cities has dwindled since the mid-20th century, but there are an impressive number to be found. With the growing popularity of the cargo bike we can expect the armada to swell in size. Which is a good thing. At the end of the book there is a list of the brands featured in this book. I've counted 23 recognizable brands and easily 20 cargo bikes that are undefinable because they are vintage or customised. Add to that the postal service bikes, pedicabs and the no-name Chinese bikes that some shops sell in Copenhagen. Fourteen of the brands are Danish. Hey, it's a big market in Denmark. It's worth stating, however, that there are a great many other brands out there in the world. I don't have photos of all of them - although I wish I did. In particular, the United States is experiencing fantastic growth in the number of companies producing cargo bikes. It's all good. It was a maddening process selecting photos for this book. 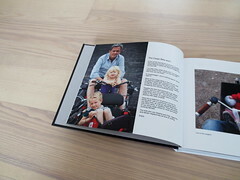 At the end of the day I just wanted to produce the ultimate cargo bike photo book. Nothing sells cargo bikes like a long line of photos showing Citizen Cyclists and others using a cargo bike in their daily lives. As a vital tool for urban living. - The Cargo Bike & I - photos from my own life with cargo bikes. - La Famiglia - how families use cargo bikes. - You've Got Mail - postal service by bicycle. - Municipal Services - city maintenence on wheels. - Musical Ride - musical instruments transported on bikes. - Pedicab Nation - the rise of the pedicab in cities. - Sharing is Caring - it's not just rugrat transport... cargo bikes are for friends and loved ones. - The Buy Cycle - selling goods and services from cargo bikes. - Trailer Park - let's not forget the trailer. - The Classic Short John - photos of the ShortJohn/delivery bike/butcher's bike. - Hors catégorie - Bikes that fall just outside the cargo bike category but that are cool. - Early Learning - kids on mini-cargo bikes. - Flea Markets - cargo bikes used in connection with flea markets. - Aging Gracefully - bikes and trikes for the elderly. - You've Got to Move It - moving your stuff around the city by cargo bike. - Svajerløb - The Danish Cargo Bike Championships 2009-2012. - Chameleons - people moving stuff on regular bikes in cargo bike spirit. - Favourite street shots - some of my favourite shots from 6 years of photographing the subject.